To get good exposure of the statue and the background church, without blowing out the sky? Standing on the opposite side of the statue is not an option. I want perfect dynamic range with full detail in the clouds, no blown out areas, but also full detail at ground level. Obviously the scene is too large to use a fill flash. Would you use a graduated ND filter? A CPL filter? Would you spot meter on the statue? HDR bracketing? I don't see how an ND filter would help. If you can't get any light on the statue, then you can try shooting Raw and "coaxing" the highlights and shadows, but, well, good luck! Otherwise, exposure bracketing and HDR is your best bet, and then in the future plan for shooting with better light! ND makes no sense whatsoever. Bracket and blend the exposures or do a HDR. What camera are you using? Lots of camera's of late have built in HDR modes. They work really well in my humble opinion. Especially when you don't have a tripod handy. Even my point & shoot Panasonic has a good one that gives quite natural looking results. I'd post up a couple of shots, but I'm on the phone. Thanks for the responses. I'm critiquing old shots to better learn photography. This shot was taken auto mode with an S3 IS, but my current camera is a Canon T5i with magic lantern installed, so exposure bracketing and post editing of raw would be a cinch. Would a CPL filter + exposure bracketing work well for this image? A CPL wouldn't help much, if at all, in that shot, as the sky is mostly cloud. Likewise an ND won't help as it just reduces the overall exposure, it will darken the statue as much as the sky. 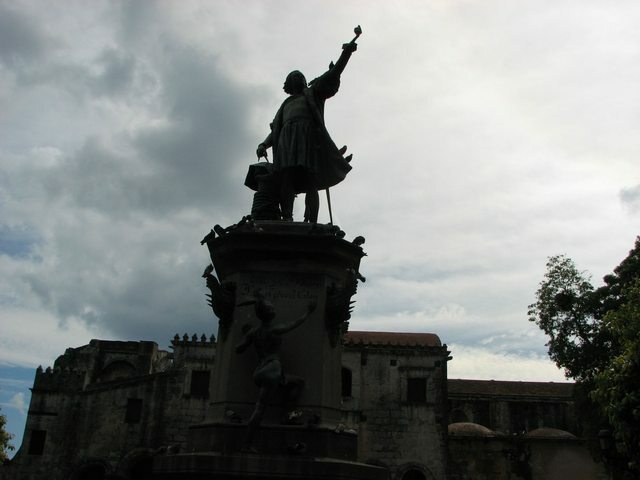 My personal choice would be to take two shots, one exposed for the statue and one for the sky, then blend them in post. Alternatively, you could bracket shots and use HDR software to give a more balanced result. A CPL is always nice for working with sky. For this shot I'd use a tripod and a handheld light meter to meter both the sky and the statue. If you don't have a handheld light meter you can use the spot meter in your camera (not familiar with the T5i). Bracketing the sky and the statue separately will give you the best images to merge for an optimum image. If it were really important I would put the camera on a tripod and make two exposures. One for the statue and one for the sky and then merge the two together. Bracketing? Just get the two good exposures of each. Spot meter the statues and get hte meter reading off something about 18% gray that you want render as such and then do the same for the sky. Two well placed exposures is all that you need. Open it in Photoshop. Select Image > Adjustments > Shadows/Highlights.